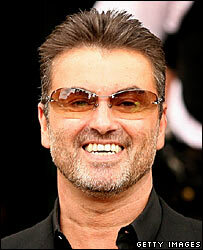 Singer George Michael has said the world would be an "easier place to live with" if cannabis was legal. Speaking to ITV chat show host Michael Parkinson, the star said he was not "advocating" the drug for everyone. "Nobody ever came home stoned and beat up their wife," the 43-year-old former Wham! singer said. Earlier this month he pleaded guilty to driving while unfit through drugs after he was found slumped over the wheel of his car in a London street. He blamed his behaviour on the death of his mother, Lesley, in 1997. "I know I have a very self-destructive tendency since my mother died, I have got to be honest. That has kind of made itself clear in other ways," he said. During the interview he also revealed he was addicted to prescription drugs. Despite the star awaiting sentencing at the end of the month, he claims he did nothing wrong. "Ultimately I didn't break the law. I did something stupid, and doing something irresponsible is not a position that I am normally used to defending myself in," he said. Michael will become the first artist to play the new Wembley Stadium next month. He revealed that he approached Wembley bosses asking if he could play the first show, and told Parkinson: "It's like my dream come true."